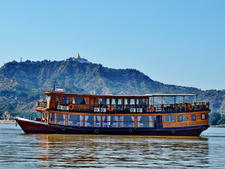 This small, atmospheric wooden vessel carries eight passengers and offers one- and two-night cruises on the Irrawaddy in Myanmar (Burma). 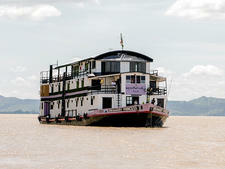 It is owned by the Tint Tint Myanmar Group of Companies, which operates three other vessels in the region. Yandabo is the name of a pottery village between Mandalay and Bagan, historically recognized for the signing of the 1826 Yandabo Treaty between the British and Royal Burmese Court of Inwa. The vessel was named in honor of the peace treaty. Accommodations are provided in three superior twin-bedded cabins on the Main Deck, each with a private bathroom and shower, and a deluxe cabin, with a fixed double bed, on the Upper Deck. The cabins are 140 square feet and 150 square feet, respectively. Facilities include a lounge and bar on the Sun Deck, and the chef serves a choice of western, Burman and Chinese cuisine. Complimentary tea and coffee are available throughout the day. Other beverages from the bar menu are charged to passengers' accounts. 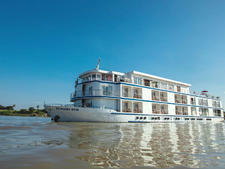 The vessel sails one- and two-night cruises between Mandalay and Bagan.